When Lisa Brunner got the news that Congress had passed the reauthorization of the Violence Against Women Act in 2013, she was attending a meeting on her reservation, the White Earth Objibwe Nation in Minnesota. “I had to go outside and do a victory dance,” she recalls. A survivor of sexual assault, Brunner had lobbied Congress for years to restore the ability of tribal courts to prosecute non-Native men who abuse Native women and children on reservations. In the 1978 case Oliphant v. Suquamish Indian Tribe, the Supreme Court stripped Indigenous nations of criminal jurisdiction over such incidents, ruling that Indians could not prosecute non-Indians for crimes committed against tribal members on their land. The ruling exacerbated an epidemic of domestic and sexual violence on reservations, as 86 percent of rapes and sexual assaults against Native women were perpetrated by non-Native men. As a result of the decision, only federal prosecutors could pursue criminal charges against non-Indians, which they declined to do in 67 percent of cases between 2005 and 2009, allowing the largely white perpetrators to continue with impunity. The implementation of VAWA in 2014 restored at least some accountability. “To have a victory like that was really profound and very critical,” Brunner says. If you haven’t heard of Dollar General Corporation v. Mississippi Band of Choctaw Indians, you’re not alone. Even as the Roberts Court comes under scrutiny for routinely enhancing corporate power, state and private assaults on Indigenous self-determination rarely get attention. 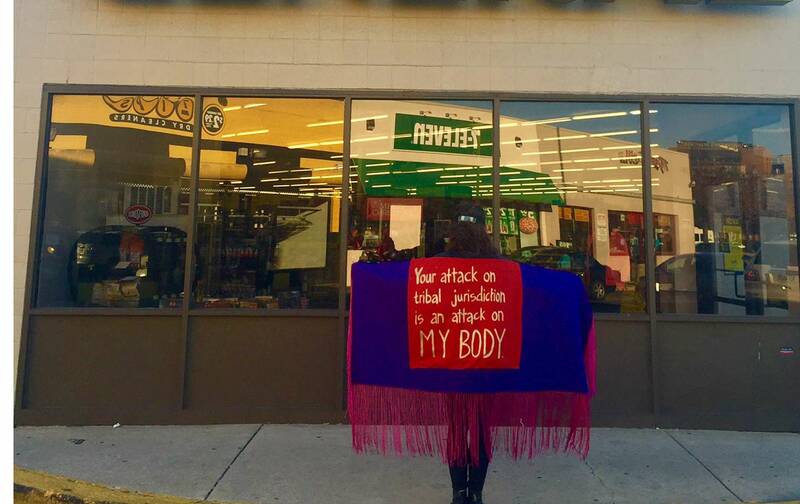 “I feel like Dollar General is using a lot of arguments that corporations routinely use, but somehow when they’re put into an Indian context, most people lose the ability to follow the line,” says Mary Kathryn Nagle, attorney for the National Indigenous Women’s Resource Center and a Cherokee citizen. The case is rooted in accusations of child sexual abuse brought over a decade ago. In the summer of 2003, a 13-year-old Choctaw student, whose name has been withheld, claimed a white store manager named Dale Townsend repeatedly molested him at a Dollar General store. The teenager was enrolled in his tribe’s job-training program and was placed in the store on the reservation. If the allegations are true, his experience was tragically common. Native children in the United States endure rates of trauma three times the national average, suffering from PTSD at a scale comparable to veterans returning from the wars in Iraq and Afghanistan. When federal prosecutors refused to bring charges, the victim’s family sued Townsend and Dollar General for damages in Choctaw Tribal Court, alleging the company had failed to properly vet and supervise the manager and was responsible for his violent conduct. The 1978 decision in Oliphant prevented the tribe from prosecuting Townsend criminally but not from suing him and the corporation in a civil tribunal. Over the next decade, Dollar General was unable to convince successive courts both on and off the reservation that the Choctaw lacked civil jurisdiction over non-Indians, even when they willingly operated businesses on tribal land. “In each step of the litigation, their arguments have become more extreme,” notes Gregory Ablavsky, a law professor at Stanford University who co-authored an amicus brief in favor of the Choctaw’s position. “It’s become an activist case on behalf of people who are opposed to tribal sovereignty.” Today they’ll bring these arguments before the most pro-business Supreme Court in more than half a century. These laws are, in fact, written. As with many of the 566 federally recognized Indian nations and tribes in the United States, the Mississippi Choctaw have a constitution with guarantees for due process and equal protection to any “person within its jurisdiction.” Conflicts are adjudicated in a sophisticated court system that “provides an arena for the fair, reliable resolution of disputes,” as the Harvard Project on American Indian Economic Development observed in 2005, including in numerous cases involving non-Native people. Dollar General is imploring the Supreme Court to complete the “unfinished business” of Oliphant v. Suquamish Indian Tribe. Writing for the majority in 1978, then associate justice William Rehnquist cited nineteenth century precedent—conveniently using ellipses to obscure words like “savage” while keeping the legal reasoning intact—to cast Native Americans as fundamentally lawless and uncivilized, incapable of affording justice to people outside their communities. Much of Rehnquist’s reasoning was rooted in the “doctrine of discovery,” a 15th century papal bull granting Christian explorers automatic ownership over any land they stumbled upon that was occupied by “pagans.” Even as explicitly racist language has largely been expunged from US law, the Supreme Court still regularly relies upon this principle, brought into US jurisprudence by John Marshall in 1823. “What happened from Oliphant was not that federal and state law enforcement agencies stepped up to fill the law enforcement gap that the decision created,” notes Ablavsky. “Instead, what it far too often created was lawless spaces where non-Natives felt that they could act with impunity and far too often they could.” Now Dollar General wants to do the same for the ability of Indian people to sue non-Native corporations. Andrew Bard EpsteinAndrew Bard Epstein is a graduate teacher and researcher in history at Yale University. Follow him on twitter @andeps.